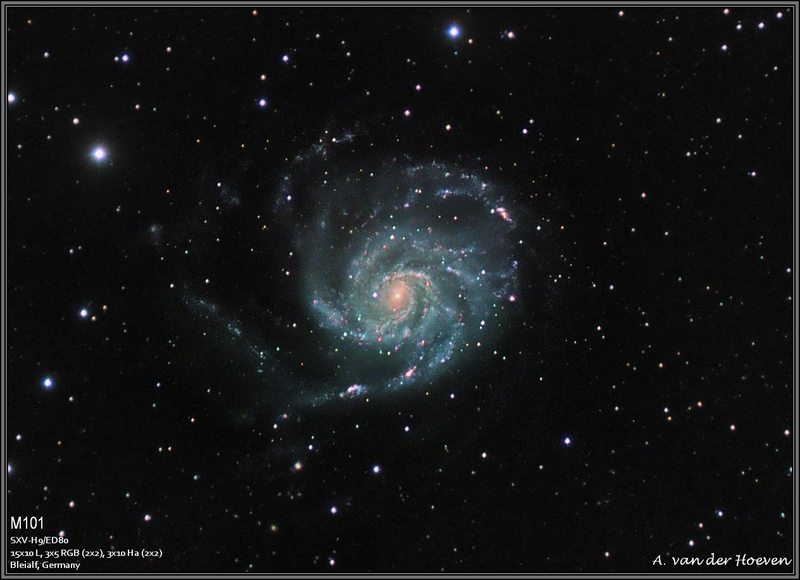 The Pinwheel Galaxy (also known as Messier 101 or NGC 5457) is a face-on spiral galaxy distanced 21 million light-years (six megaparsecs) away in the constellation Ursa Major, first discovered by Pierre Méchain on March 27, 1781, and communicated to Charles Messier who verified its position for inclusion in the Messier Catalogue as one of its final entries. On February 28, 2006, NASA and the ESA released a very detailed image of Pinwheel Galaxy, which was the largest and most detailed image of a galaxy by Hubble Space Telescope at the time. The image was composed from 51 individual exposures, plus some extra ground-based photos.